Welcome to the first edition of La Voix created and published natively on our new website. Several weeks ago, I told you - in my board of directors self-nomination statement - that there were two major initiatives that I wanted to see through before passing the reins on to my successor. The new website is the first of these initiatives. I'm really proud of the way it came out and hope that you likewise are proud of and happy with the site. It provides us with a fantastic platform that we can leverage to enhance your member experience. If you haven't already, check it out! Beyond the new website, we have some good stuff coming up right around the corner. First, we will be launching our fall kit order featuring our all new 2018 kit design later this month. Stay tuned! This year's kit will be debuted in manner unlike anything we have done in the past. I'm excited! Second, our Annual Banquet and Awards Ceremony is coming up on Sunday, November 5th. Details to come. One thing we are doing differently this year: we will not have our annual club photo the morning of the 5th before the banquet. Instead, we will take the annual club photo in January 2018 so that we can all wear our new 2018 team kit. The board felt it made a lot more sense to take the photo in our new kit (which we intend to remain current throughout the 2018 and 2019 seasons) rather than take a photo in kits that would be superseded just 2 months later. We'll announce the date for the photo when we finalize the 2018 Event Calendar. Third and finally, nominations and voting for La Granger of the Year will be starting up soon. With so many amazing members doing some great things in 2017, we expect some great nominees and some difficult decisions at the ballot box. As a reminder, YOU the club members vote on and decide who wins La Granger of the Year and all current members of the La Grange board of directors will not be eligible. So start thinking now of who you want to nominate for the highest honor we can bestow on a member. Stage 3 of the Piuma Hill Climb was a great success. We had only one rider take a dirt detour at the left hand turn to Schueren, and he only had three or four shards of gravel embedded in his skin when he arrived later at the club picnic at Rustic Canyon Park. Congratulations to the fastest female finisher (Tracy Paaso) and the fastest male finisher (Stefan Zavislan). 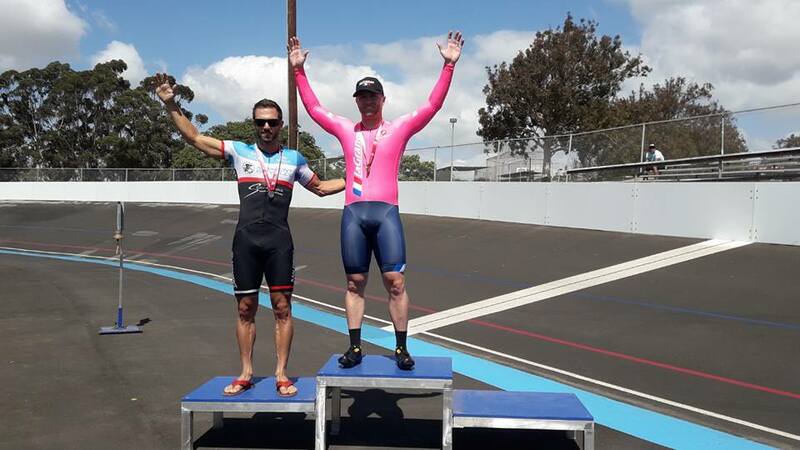 Tracy and Stefan, along with the winners of the Encino 500M sprint and PCH 20K Time Trial, as well as the age category and overall winners of the La Grange Cup, will all get custom winners jerseys supplied by our beloved sponsor Castelli. Our friends at Castelli also supply us with Bear Jerseys for our State Champs, and all of these jerseys will be presented to their new owners at the Annual Banquet and Awards Ceremony on November 5th. Like everything else the club does, it's only through the efforts of our volunteers than we get anything done. Leo Rusaitis's Piuma video was so good that Castelli shared it on their Facebook feed to their more than 130K followers! Dan Chapman once again was out and taking great photos and this time sharing his art. The finishers at the top of Schueren! Todd Schoenbaum is pretty in pink with another Track State Championship! Joey Santa Cruz joins Todd for Bear Jerseys in the Team Sprint! Congratulations to Our August 2017 Racers of the Month!